Many years ago my mother had an aged friend that for years took a photograph of the sunset from her balcony apartment. She had a terrific view and, while the pictures collected in multiple albums were indeed beautiful, as a teenager I found her practice to be a bit odd – if not peculiar. After all, there were so many other things that one could be “doing”! Perhaps it’s not until you reach a certain age, or have had some set of threshold experiences, that you begin to reflect on your past and the whys of your present. If only such meta-cognition could come earlier! But then, I guess, it’s the reflection upon one’s own history that creates the deepest of meanings and the most settled understanding. What is it about youth that drives one so inexorably forward? Is it the sense that you are just at the dawn of life’s arc? I recognize and remember that person in me, but he and I are different somehow. I hate to think that it’s because at my ripe old age of forty-two I am sensing the interminable decline towards death! With sore muscles and joints that creak, has this mortal coil just about given up the ghost? Is it all just a matter of waiting out the game? Well, of course not. Nor has it ever been, though it might feel like that from time to time. One’s life is punctuated with ripples and crenulations – some crests, some troughs. At any moment we can experience an event with the pull of gravity, or the exhilaration of weightlessness. We are who we are from the experiences that shape us. The old and grey are not the only ones who can impart wisdom. When wisdom comes, it comes in the form of a unique kind of knowledge that has been forged by reflecting upon past events, and the feelings that orbit around them. Upon reflection, what is old becomes new again. What if we spent more time examining the journey rather than focusing on our destination? As busy adults - with full-time jobs, mortgages, school-age children, etc. - if most of us spend our lives repeating similar habits and patterns day after day, mightn’t we find greater richness in the seemingly mundane if we took a closer look at the what and how of what we do along the way? Perhaps what is truly essential and definitive is not just the thing we do, but the doing of the thing itself. In The Path: A One-Mile Walk Through the Universe, author Chet Raymo invites us on a tour of his daily walk to work. A professor emeritus of physics and astronomy at Stonehill College in North Easton, Massachusetts Raymo shares with us the interwoven stories that lay at his feet. The book is broken into sections that define his walk. Each new chapter opens much as the landscape does before Raymo as he walks from his home: through woods and verges, across a brook and open fields, into the water meadow, an old orchard, and community garden. Raymo speaks to us as a naturalist might, elucidating the particular geological and biological facets of his walk. One can imagine him lingering over the smallest blossom, or the flash of a crystal face reflecting the Sun’s light. And then, beyond the firm, to the cycles that draw the multitude together. The players he describes are connected by the very atoms that they share. And yet, The Path reads more like a novel than a work of natural history alone. Raymo centers his love of wilderness within the frame of the human history that has shaped and reshaped the land through which his path meanders. Like the trail that he travels, readers are quickly mesmerized by the rich and complex lives of the people he describes. Each new story is another step along his path, another moment of unfolding and greater understanding. Everything has a story. Nothing exists in isolation. Everything is related to something else, some how. In intimate detail, Raymo shares with us the preciousness of his slice of the cosmos, revealing connections where the reader may not have guessed them, and bringing to full consciousness the beautiful enormity of the world and our lives. 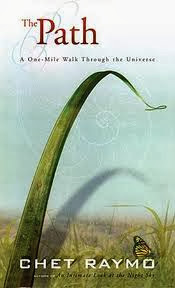 The Path: A One-Mile Walk Through the Universe (2003), by Chet Raymo. Seth, critical reflections at the youthful age of 42 years! Now, imagine your ever expanding future with this knowledge. Chet Raymo writes a book which suggests being mindful to life itself. An old 'T' Shirt' slogan says 'Life be in it" A worthy slogan which inspires. Remember your mothers friend, in her apartment. photographing every sunset as if it were her last. Her desire to 'be in life' or to 'be life' despite her aged body is from the soul and the soul never ages. Beautiful reflection Seth. Me, well I am a youthful 62years.